Scar Revision is a treatment or surgery (depending on the type of scarring) to improve or reduce the appearance of scars. It also restores function, and corrects skin changes (disfigurement) caused by an injury, wound, poor healing, or previous surgery. You may need to consider scar revision if you have had a surgery that left you with more scarring than you had anticipated. You may also consider the procedure if you have been injured. However, the surgery is not going to make the scars vanish. At Executive Plastic Surgeon we believe that is vital that patients understand that we can improve the scarring but not erase it. Scar revision can be used for improvement of both the appearance and the function of disfigured skin. Hypertrophic scars (sometimes caused by burns) can cause serious issues with function and limit muscle movement. What Can Be Accomplished With A Scar Revision Procedure? The goal, as with all procedures that Dr. Shaher W. Khan (M.D.) performs at our Detroit area office, is to make the patient look and feel better. Whether the patient is self-conscious of the appearance of the scarring or is dealing with pain or problems from scar tissue healing improperly, we are committed to helping each person live their best life. Another important factor is how long you have had the scarring. It is recommended to wait at least a year before considering scar revision. This is because it will take time for the skin to heal and it is not possible to know how much of the scarring will last. Sometimes, patients are eager to get rid of their scars but rushing into the procedure is not wise. You should wait to see what the scarring will look and feel like after it has been given time to heal. Scar revision is sometimes needed after an injury but can also be performed on scars from prior medical procedures. 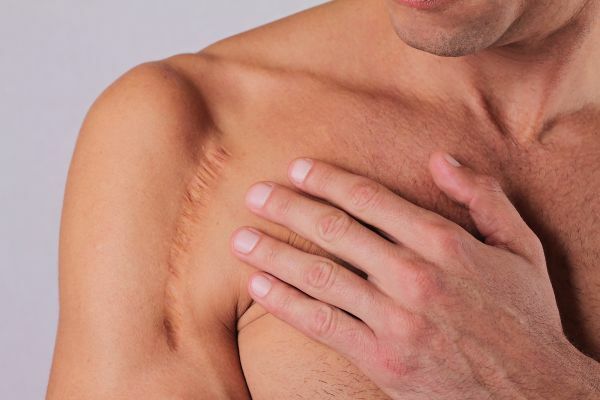 It is important to understand that not all scars are the same and that different scarring will require different considerations on your part and on the part of your doctor. Hypertrophic scarring is the result of an over reactive response of the skin to an injury. They are raised and hard but not to the degree of the keloids (see below). Contracture scars are typically seen after severe burns. They are just what they sound like – the skin contracts over the wound. They make the skin very tight and can cause lack of mobility and pain along with other symptoms. The different types of scars require varied treatments and your surgeon will decide which type of surgery or treatment is best for your specific circumstances. Some procedures are minimally invasive and involve only lasers, for example, while others are very invasive and require a serious surgery. What type of treatment you need will be determined based on many criteria. Dermabrasion is minimally invasive. It softens the surface of the skin and reduces irregularities by brushing away the upper layers of skin and allowing new skin to grow over the area. Laser therapy can also soften the scarring and encourage new collagen growth. Similar procedures include chemical peel and skin bleaching. Very large injuries may require surgery to remove extra scar tissue and the doctor may attempt re-orient the scar so that it releases stiffness and rigidity in the scarred skin. Skin grafting is, essentially, a skin transplant and is a relatively invasive procedure. This is usually necessary for larger injuries where there is not enough healthy skin around the wound to use. Skin flap surgery is similar to skin grafting, but the skin is moved from one site to another with an intact blood supply which is not the case with a graft. Tissue expansion is often used during breast reconstruction but can be used in other situations too. The tissue is expanded (with a balloon of sorts) creating more skin for the doctor to use during surgery. Improvement in skin tone and minimized discoloration. Discolored tissues are a common result of scarring. A scar revision procedure will help to match the scarred skin to the rest of the skin surrounding it. Improvement in uneven skin texture in raised or disfigured areas. Patchy consistency is another problem that can be reduced by treatments like dermabrasion or fillers depending on the patient’s needs. Raised areas will be flattened by dermabrasion while fillers can help to plump out sunken areas in the scar tissue. Interruption in scar lines. Straight lined scars are more noticeable. The straight lines can be replaced with scars that curve and/or are broken up. The goal is to make the scar less noticeable by creating less visible or noticeable scars. Psychological: If the patient feels insecure about the appearance of scarring, the procedure may allow for a boost in confidence. It may also have very positive mental health effects for people who were suffering from mobility issues after scarring. Physical: Scar revision can reduce skin tightness which may cause mobility and function issues. It can also help with pain or discomfort associated with the scarred tissue. Your medical provider will walk you through exactly how you will need to prep for surgery. However, it is advisable to all patients to prepare by getting rest, drinking water and getting mentally ready. All plastic surgery is emotional for people. Surgery, in general, is frightening to some. Fears are normal and natural. It would be odd if a person did not have any emotions about the process. It is important that patients have reasonable expectations prior to getting the work done. They should also contact a psychological professional if they have any mental health symptoms associated with the scars, the procedures, etc. Recovery & What Should I Expect After The Procedure? Recovery will vary depending upon which procedure you have. It cannot be emphasized enough how important it is to be in constant communication with your doctor during the healing process. If you have questions, concerns, or need medical attention, you must call immediately. There will likely be swelling, discomfort and discoloration for about 2 weeks. It is always prudent to have someone with you for the first few days after any surgery. The same things that keep you healthy in normal life will keep you healthy during recovery – lots of water and rest. Exercise is fine if your doctor allows it but that will depend a lot on the type of procedure as well as its location. Keeping the scar out of the sun for approximately a year is also recommended. If, for any reason, you begin to have questions about your health, if the incision seems to be oozing or bleeding excessively, or if you simply need medical attention, reach out for professional assistance. If you feel that something is wrong or that your body is telling you that it is not well, immediately see a doctor. Please never assume anything about a medical procedure. Ask lots of questions and pay attention to the answers. It is imperative that you receive qualified medical advice about any plastic surgery procedure. You should discuss your health needs at every stage of the process from the initial consultation all the way through recovery. An initial consultation with Dr. Shaher W. Khan (M.D.) will offer you an opportunity to chat about any and all of the questions you have about the process and the surgeries we offer. Dr. Khan serves the entire Detroit metro area. Call 734-419-1615 or contact us to get started finding the right course of treatment for your scarring condition.